Kirovsk is a town in the Arctic Circle in the Murmansk Oblast, which was built to mine the natural resources of the area. Here in the 1920s, geologists discovered deposits of apatite-nepheline ores. Since 1929, the Apatite Company has been operating here – now the largest enterprise in Europe that is engaged in the production of phosphate raw materials. With the creation of the Apatite Company, began the construction of the town of Khibinogorsk, which turned into Kirovsk – one of the most popular ski resorts in Russia in the winter, and the starting point of thousands of tourist groups in the summer. Snow starts falling in November, while at the same time, the temperature can drop to -40 degrees, and the winter daylight lasts only 5 hours. However, on such clear frosty nights, one has a better chance of seeing the northern lights. Despite the harsh arctic conditions in winter, the locals look forward to its arrival. Starting in mid-December, the ski resorts open. Kirovsk and neighboring Apatity fill with skiers and snowboarders who spill onto the streets, forcing inhabitants out of their official living quarters. Providing accommodations to tourist and private transport services are the second most important, in terms of earning income, after the mining of ore. A studio apartment will cost about 700 rubles (14 Euros) per night, and quite a few people can crowd into it. In the Khibiny Mountains, the season lasts from November to May. In the first months, the slopes are often empty, and lifts operate intermittently. Kirovsk is a very quiet and deserted town, not rich in après-ski. Therefore, it is perfect for those who seek peace, the polar silence, and views of a frozen 5-story town, whose residents, because of the snowdrifts, enter their homes through the second floor. At home, they sit near radiators and knit socks from reindeer fur, or people come here in December, to lie down in a blizzard with a book, meditate, and to become sole kings of Khibiny peaks. And then, if the weather cooperates, from dusk to dawn (in Khibiny this lasts not more than five hours), they go for a ride on a thick layer of loose, fluffy snow. However, in May, you can go riding during the entire polar day in the scorching sunshine, – and this is what Kirovsk is famous for. Khibiny is an inactive volcano that was able just once to spit onto the surface a large amount of rock – a huge mound with a diameter of 50 kilometers – while the magma remained inside. Being some of the oldest mountains in Russia, they are the center of the Kola Peninsula. Thanks to the incredible variety of rocks, this mountain range is second in the world. Khibiny gave Russia the richest deposits, which contain 110 rare minerals that exist in a unique assortment, and only here. The highest point is Mount Yudychvumchorr (1,200 meters), which means “Mountains in Gudyasha Valley”. These names were given by the Sami, people who inhabited almost the entire Kola Peninsula in the 19th – 20th centuries. Aykuayvenchorr is considered the most poetic mountain in the Khibiny. This mountain is one of the most popular among tourists and local residents. Literally, the name of the mountain means “Mountain of the Mother of God” – the narrow ridges form the silhouette of a face, turned towards the sky. Aykuayvenchorr is famous for being the best mountain to ski down from. Big Wood – the most popular resort in Kirovsk, which is the closest in providing services based on European standards – is situated on the southern slope. It is equipped with Doppelmayr cable cars, which run a distance of 1,800 meters. Last year, Bartholet Maschinenbau lifts appeared. There is a snow park and all the trails are suitable for fun carving in the Big Wood. Not far from the slope, there is a café, with a children’s room. Local creative people came up with unusual names for the slopes. For example, having descended the “VMF Slit” (literally Navy Slit), the rider enters directly into a deserted Naval Base. Standing on the top of the mountain, away from the ski lifts, you can see an amazing industrial landscape – plants, pipes, mines, and railways, all of them were closed down a long time ago. Exactly the same landscape can be seen around another ski resort, which is located 25 kilometers away from the city on Kukisvumchorr Mountain. This one is also called Polyarnye Zori, after the name of the neighboring city. From the top of the Polyarnye Zori, one can see a purely industrial, but realistic and majestic landscape – the smoking tower of the famous Kola Nuclear Power Plant, which was the first Russian nuclear power plant, built in the Arctic Circle. Thanks to its operation, the entire Kola Peninsula and Karelia are supplied with electricity. The significance and, to some extent, the mystery of the Kola Nuclear Power Plant, led the science fiction writer Dmitriy Glukhovsky to make this area, along with the town of Polyarnye Zori, the only possible refuge for survivors after the apocalypse (Metro 2034) . The relief is varied on Kukisvumchorr Mountain, but often the upper slope is quickly made as smooth as ice. Then experienced riders go to the other side of the mountain. There, beyond the bend, starts the freeride zone, which is a real polar freeride, with extremely dangerous avalanches, which often turn into terrible storms and blizzards. Snow falls not only from the sky, but it also rises from below and, in general, from everywhere. It is dark all around, the wind blows from everywhere, and it is not clear what is under your feet and what is around you. You cannot even see where you are going – up or down. Every year Khibiny hosts the Freeride Khibiny Open Cup. The route often goes through the so-called “Apatite Circus”, which is situated in the Rasvumchorrsky Quarry. One can hardly believe that by mid-summer, there is no trace of snow and they hold mountain bike competitions there. The most accessible ski area is the northern side of Aykuayvenchorr Mountain, it is also called the City Side. It is located within a 15-minute walk from the city center. 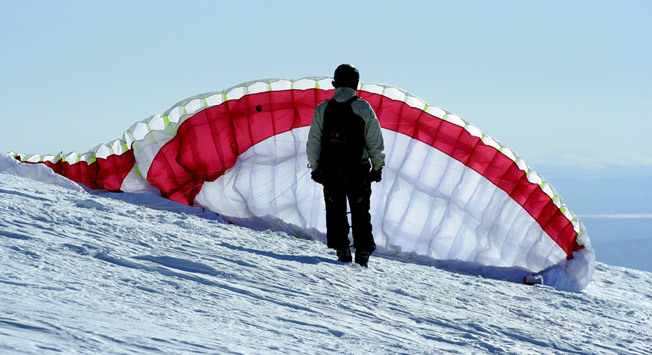 There are lifts on the slope, but the most interesting descents are not on the routes. A little further along, there is a train of narrow and steep couloirs, simply called the “comb”. There are places with accumulated ice where climbers with ice axes are trained, and there is a local landmark – the “City Gap” – a long plot, wedged between rocks, which is used for freeriding, and a virgin field with loose, fluffy snow.